NORTHRIDGE, California – One of the most stellar attractions at the Museum of Science in Boston is the Charles Hayden Planetarium—more spectacular than ever after a recently completed $9 million renovation. 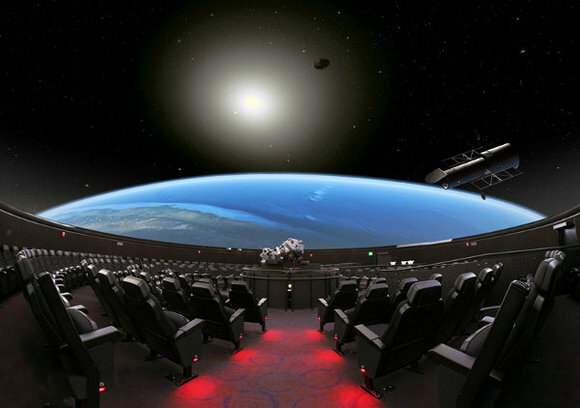 The Planetarium is the most technologically advanced theater in New England, and in addition to a state-of-the-art digital projection system, the Planetarium features an equally impressive 10.2-channel HARMAN JBL loudspeaker system. To deliver the expansive sound required for the almost 60-foot dome, theater designer Kurt Berna and the Sky-Skan team installed eight JBL AE (Application Engineered) Series AM6340/95 high-power 3-way loudspeakers, two AM6212/00 high-power 2-way speakers and two ASB6128V high-output dual-18-inch subwoofers. The AM6340/95 speakers are driven in bi-amp mode, and the speakers are powered by two Crown Macro-Tech i Series MA-5000i, four CTs 1200 and five CTs 2000 amplifiers. The mixing console is a custom Sky-Skan mixer, and audio signals are handled by three BSS Audio Soundweb London BLU-160 signal processors with digital audio bus capability. The AE6000 models of high-powered AE Series speakers have been replaced by the new AE7000 models which contain JBL’s newest Differential Drive transducers.